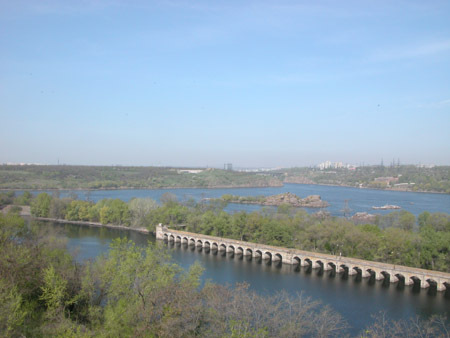 Having told in the previous album about Energodar, now we tell about another Ukraine city – Zaporoziye. I was there in passing, so I will not tell much; only of what is in photos. And about the history of names. 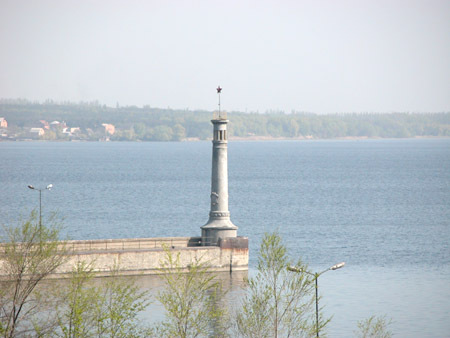 At the end of XVIII century there was Alexander’s Stronghold there, then it was Alexander’s Posad, then it was Alexandrovsk city (1806) and, finally, Zaporoziye (1921). 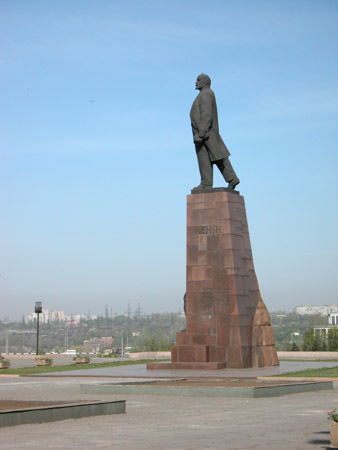 Lenin Prospect is the main prospect of the city. They say it is the longest in former USSR. Outwardly it remained me Moscowsky Prospect in St Petersburg (it is built up with similar buildings according to similar principles). In a good meaning. 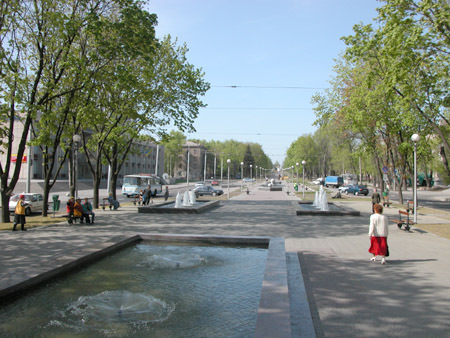 The prospect leads to Lenin Square in front of DneproGES. 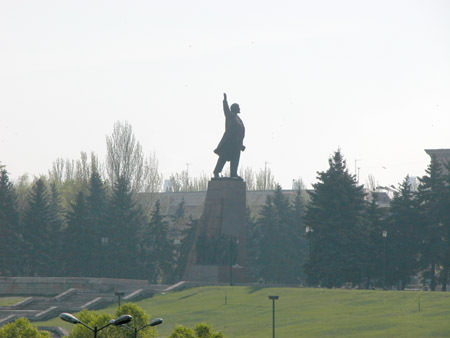 The embankment nearly is designed with Lenin Square and appropriate monument, and it is paved with granite flags. The whole complex looks quite harmonious. DneproGES is a quite impressive construction. 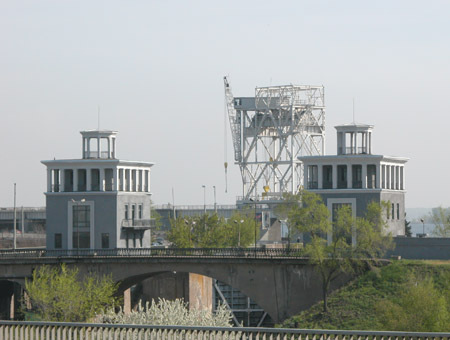 The Electro Station project was adopted in 1925; they began building in 1927; the first unit was started up in 1932 (there was the 70th anniversary in 2002). 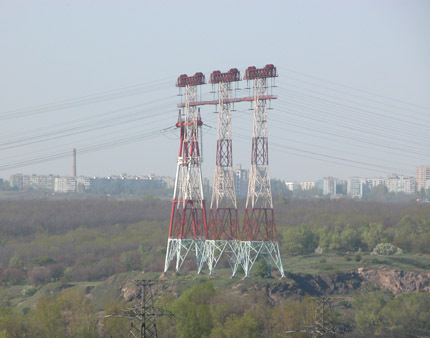 To 1939 the Electro Station reached its planned production capacity. In the same time the city was a regional centre. Pay attention to a building on the left (there are generators there); it was build according to V. Vesnin’s group project Vesnin is a constructivist architect of 1920s. It is possible to estimate a scope here; overhead it can be seen “Ikarus” bus. Domestic engineers and workers constructed the dam; Americans advised about. The author of a technical project was A. Alexandrov; the Manager of DneproBuilding was A.V. 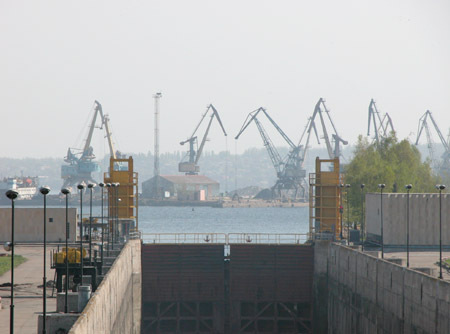 Vinter; the Chief Engineer was B.E. Wedeneev. 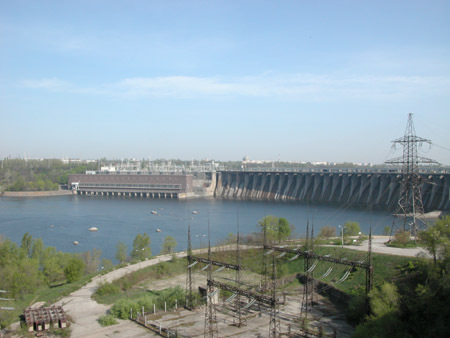 It was requested to construct a dam, electricity station, locks and bridges. And, certainly, habitation, factories, and infrastructure had been built before. 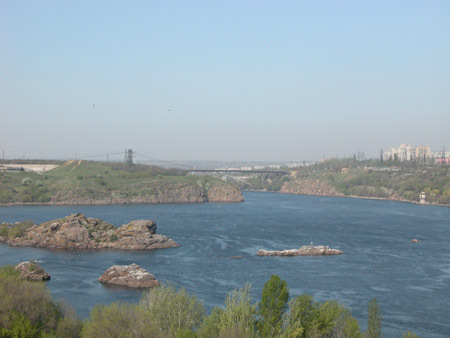 There is Khortitsa island on the left of the photo (it is big, but it can not be seen on the photo). Thanks to its nature it is declared to be a geological reserve, as well as close-fitting mountains. 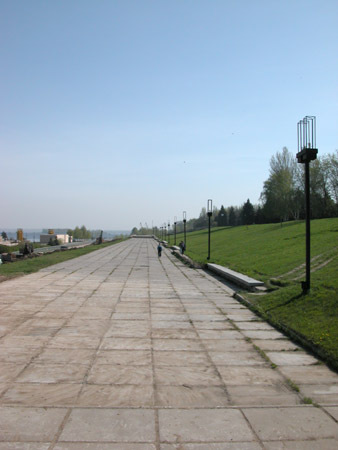 There is a Zaporoziye region called “Right Bank” on the right. There is great number of gulls on mountains. During the War, in 1943, fascists while retreating detonated the hydroelectric power station, dam carriageway and antechamber bridge. Besides electricity, DneproGES was to decide problem of thresholds, which made navigation impossible. 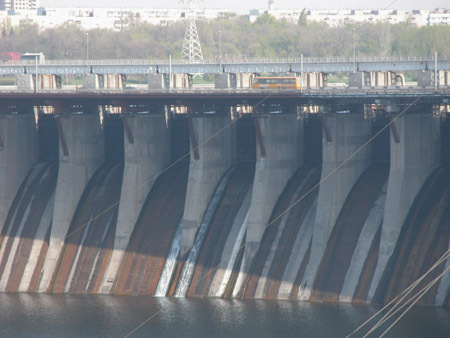 Dam building flooded 9 thresholds between Zaporoziye and Dnepropetrovsk (water rose on 37.5 meters). 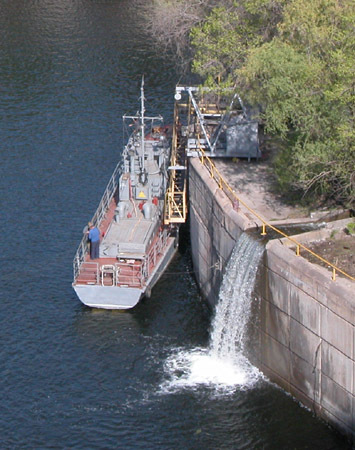 One of the locks has a level drop of 45 meters. It is interesting, one of the problems, which did not allow a dam building before the Revolution, was big number of churches in flooding zone. There is something is pictured or written there, but not understandable from a distance. 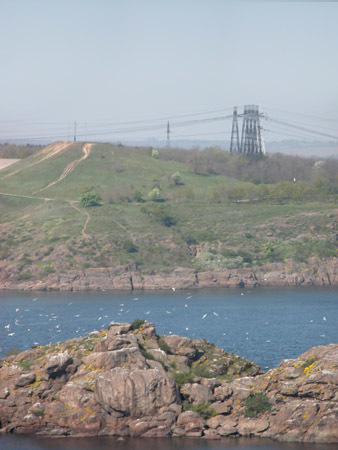 In 1969-1980 DneproGES was reconstructed to increase of lock capacity and dam carriageway. Also, at the left bank one more control room was built. This period is called as “Dneprostroy-3”. In 2002 stop beams (a metal wall before locks) repair was made to take away thread of water break and banks flooding accordingly. 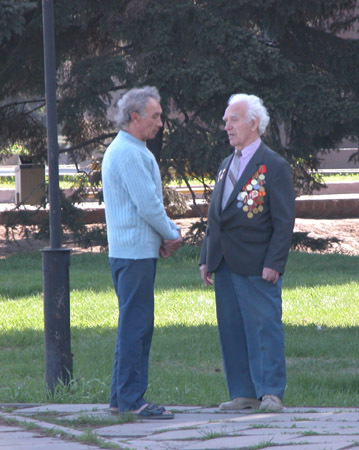 Well, we were in Zaporoziye in the 8th of May, the day before Victory Date. Flags along embankment are overgrown with grass here and there; that makes a sense of some desolation. 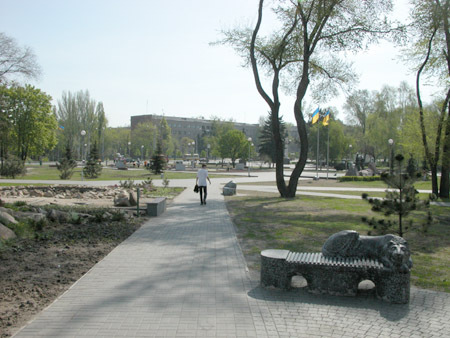 Now walk a little along Lenin Prospect. 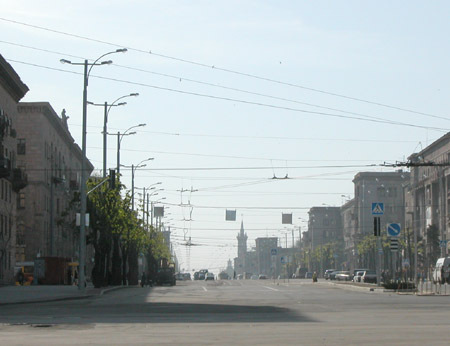 Shevtchenko Avenue deviates from the Prospect. 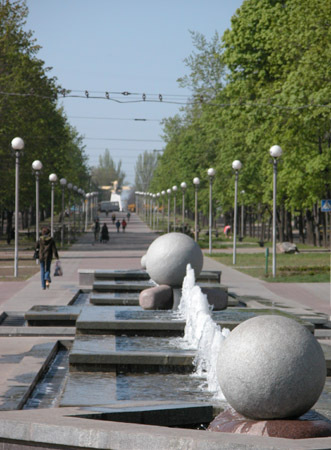 It was reconstructed as a pedestrian zone, but much more respectable, than our Malaya Koniushennaya/ Malaya Sadovaya and has a number of little fountains. Inhabitants said, that the street is a merit of their last myor. 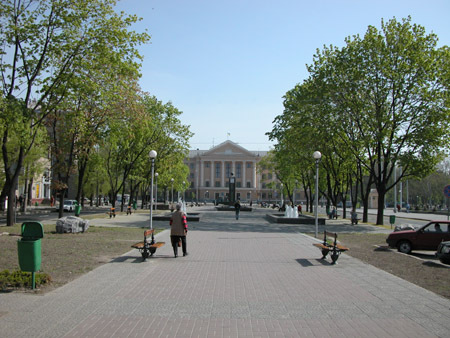 There is a building of city administration in the distance. Inscription on the building says: “Dneprospetstal”. 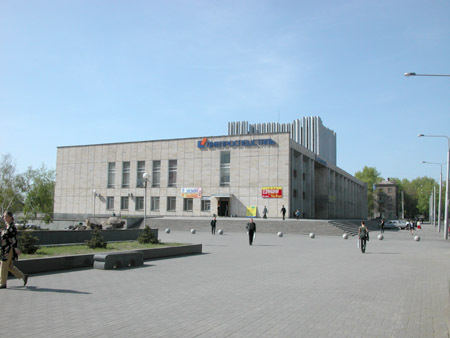 This is the Oktiabrsky – the Palace of Culture of “Dneprospetstal” plant. The biggest Palace of Culture in the city. At the same place, near the fountains. Sasha, Oksana, Yulia and Vitali. Thanks to Vitali and Oksana for transport and keeping company (by the way, on the results of the trip I suggest to public a couple of albums in addition to Zaporoziye and Energodar). 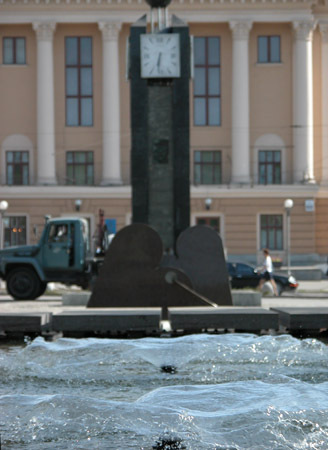 Thanks to Sasha and Yulia for showing the place, where DneproGES and fountains are.